I heard about Bangalore Express from a colleague. He was heartily recommending it to another colleague who had asked for a good place to eat Indian food. I checked out the menu online and once I spotted they served vegetarian dosas, I knew I had to give them a try. So the next time I was meeting up with friends for dinner in London, I suggested the Waterloo branch. We got there just before 7pm and had no problems getting a table for two and as it was reasonably quiet, I think four or six people would still have been accommodated. The Waterloo branch has the novelty of ‘bunk tables’ up little ladders, but I was grateful we weren’t offered one of those! You can’t have an Indian meal without popadums and thee came with mango chutney, beetroot chutney and garlic pickle, which was really nice. I plumped for the vegetarian dosa and, worried that it might be a little dry and lonely, got the pickled aubergine salad as a side dish. The menu doesn’t say whether there are the traditional dosa accompaniments and my inquiries brought a pitying look from the waitress as she explained that the vegetarian one only had masala mash in it. The dosa does indeed come with the usual coconut chutney and sambar. it is also huge, thin, crispy and delicious. The masala mash includes mashed potatoes, lentils, onions and mustard seeds. The coconut chutney is sweet and cooling as the sambar is hot and spicy. wasn’t what I was expecting. It was warm for a start. It was actually a generous portion of lightly spiced aubergine, all silky smooth and unctuous. The cost for two of us, including drinks, was £48. The portion sizes are big. I came nowhere near finishing my dosa and only made the slightest inroad into the aubergine. I hate to say this, but unless you are really hungry, skip the popadums. The mains were served very quickly so you won’t be waiting hungry long. I can heartily recommend Bangalore Express. There are good veggie options. It’s very tasty food. I can’t wait to go back. But I’m going to ask for a doggy bag next time! I never ate fried brekkies in the dim and distant days of eating meat – for one thing I couldn’t stand the smell of bacon. And I loathe eggs in any form. So once I’d gone over to the veggie side, they never appeared on my radar. They became occasional and faintly bizarre treats when I stayed in hotels – after all, it was always an experience to see what else you got served alongside a plate of baked beans and a shrivelled tomato or two. It all changed, though, when vegetarian sausages became more than those grease-laden things that Linda McCartney used to inflict on an innocent veggie world. So what do I want? Sausages – preferably not the boring soya ones. Grilled tomatoes. Mushrooms. Hash browns or fried potatoes. Baked beans. Toast. Not fussed about fried bread. And although I once had a yummy veggie brekkie on a train journey, complete with halloumi in lieu of bacon, I’m not into bacon substitutes either. I don’t eat eggs in any form, so I also want somewhere that will let me substitute items. 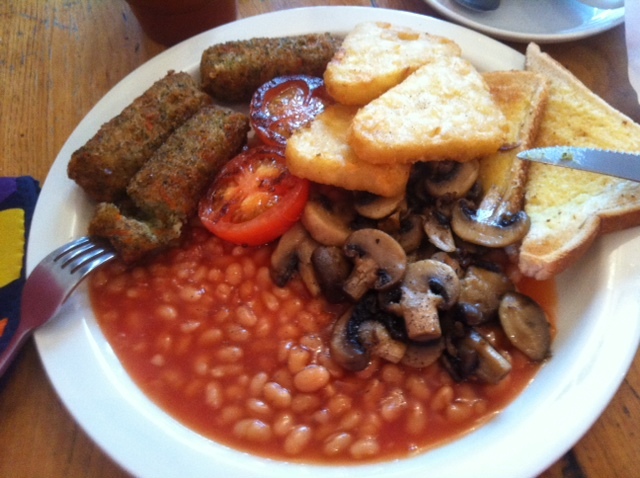 So come with me as I go in search of the ultimate veggie brekkie … And I shall now announce the results in reverse order. Hon mensh, as they say in the New Statesman competition, for the Taurus Crafts café on the outskirts of Lydney – they do a vegan brekkie. The potato cakes are sometimes a bit soggy, and last time I went they’d run out of vegan spread, so I ended up with eggless mayonnaise on my rock-hard toast (they bake their own bread there and I can confirm it’s nicer untoasted as sarnies or with soup). But hey, kudos for actually catering for vegans. In third place is Feed, a dinky little café tucked in the railway arches on the approaches to Portsmouth Harbour train station. They do nice cakes and coffee as well, and I can thoroughly recommend the veggie burgers (although that’s a story for another day). But the all-day brekkie is excellent – the sausages are decent and the star turn is the rinky-dinky crisp cubes of fried potato. In second is the café at the Royal Marines Museum in Southsea. Their coffee is best avoided, but the breakfast is a good ‘un – decent quality mushrooms cooked in butter, and tasty Caerphilly sausages. But you’ve only got a small window of opportunity, as they say at all the worst meetings – the place opens at 10am and you can only get the brekkie up until 12.30pm. Winner by a mile, though, is the Curious Café in Bath Road, Cheltenham. It lives up to its name, with mismatched tables and chairs, and a very cute garden out the back where you can sit out and eat. The opening hours are a bit weird – they open early, but close early afternoon. And it’s a fairly limited menu, based around sandwiches and wraps. Sadly, the lunchtime vegetarian sausages and mash, served with gravy and grilled vegetables, seems to have gone AWOL. But it’s a great place to meet people, and there’s a wide choice of all-day brekkies, including the best veggie one by a mile (see the piccie above). They don’t mind you substituting items either – so I get another hash brown and/or sausage in place of the two eggs. I think the first minestrone soup I made for myself would have been from St Delia’s Complete Cookery Course. Her recipe, which is light on the bacon and heavy on the vegetables, would take very little adaptation to make a delicious (and hearty) vegetarian soup. But a little too hearty for springtime, I feel. 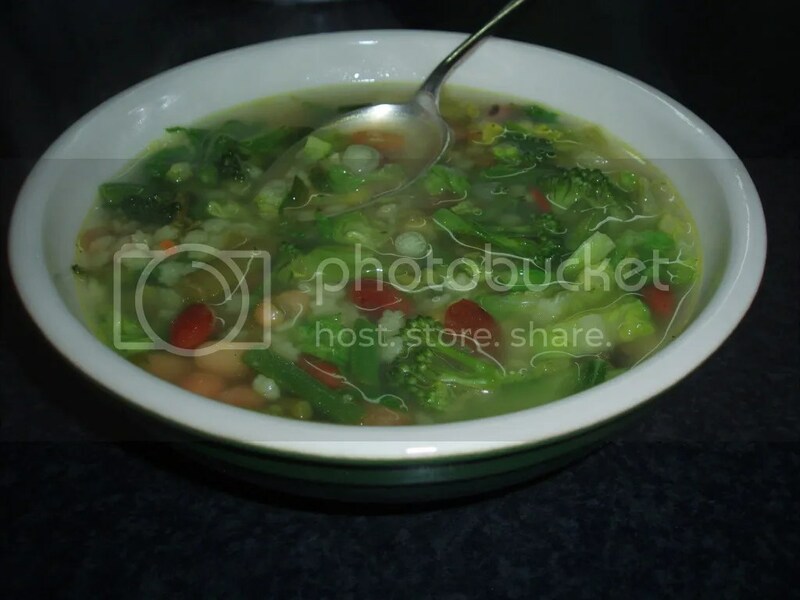 Looking for other recipes, I tried to work out what makes a minestrone soup for me. cooked beans, a green leafy vegetable, pasta (preferably the tiny pasta shapes because they’re so cute and where else are you going to use them) and whatever other vegetables are in season and in your fridge. It’s spring and I wanted to have a lighter, more fragrant minestrone. For the leafy vegetable I opted for little gem lettuce. I’ve been using it in lunchtime noodle soups a lot recently, and added right at the end of cooking it retains a sweet crunch to the end of eating. I debated long about whether I should include tomatoes, but in the end I decided that I didn’t want to change the green colour scheme of the soup. I have specified 6 fresh mint leaves to be added at the end. I didn’t want this to be a minted soup or a mint soup. Adding so few at the end, means that you get a little waft of cool freshness every third mouthful or so rather than them taking over the whole dish. As you’re only cooking leaf or stem vegetables here with very small pasta shapes, this is a lovely, quick lunch dish to make. Some garlic bread on the side, wouldn’t go amiss either! Add the oil to a large saucepan, heat and add the spring onions and garlic. Sweat these until they are translucent. Add the boiling water and stir in the stock powder. Add the beans and sprinkle in the pasta. Add the rest of the vegetables other than the lettuce and the mint. Simmer for 10 minutes or so until the pasta is cooked and vegetables are to your taste. At the last minute before serving, stir in the lettuce and mint. Serve into warmed bowls, maybe with a bit more olive oil drizzled over. I remember finding a recipe for Boston Baked Beans in the Rose Elliott Bean Book many years ago. I think it required cooking them in a Gas Mark 2 oven for something like eight hours or so. Unless you were going to do a huge batch, or find something else that needed long, low cooking, I couldn’t justify to myself having an oven on for that long. 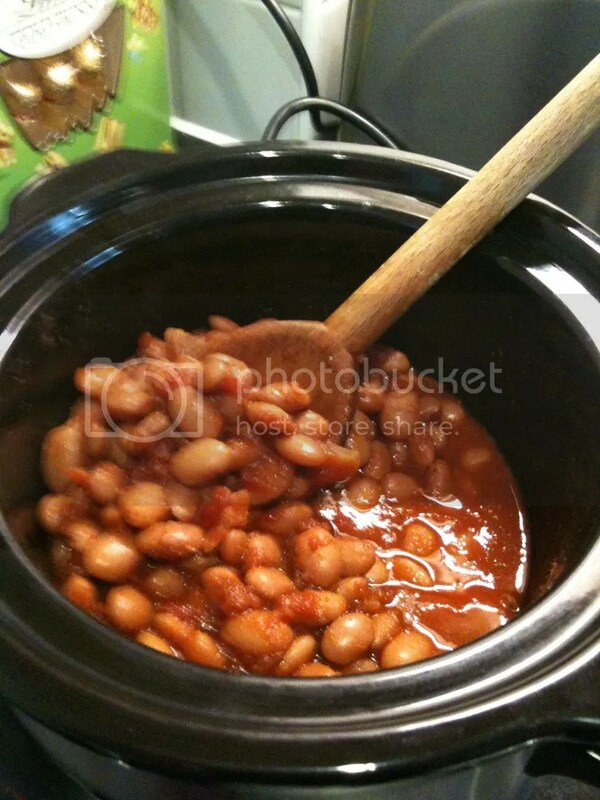 Then I bought a slow cooker and my mind turned back to the idea of making my own baked beans. The classic recipes for baked beans use haricots, and that’s the variety you’ll find in tins at the supermarket. However, I’ve had really variable results with cooking dried haricots. Some batches cook to tenderness after an overnight soak and an hour’s cooking. Other times you could cook the beans to doomsday and they’d still break your teeth if you tried to chew them. So for this recipe, I’ve gone for Pinto Beans, which I’ve had much better results with. The other ingredient the classic recipes calls for is molasses. Black strap molasses. I love the name, but my local supermarket doesn’t stock it. It does stock black treacle, but I don’t bake and I really can’t foresee a time when I use a lot of treacle on a regular basis. In the interest of economy, and the chances that I’d use it again, I went for Dark Muscovado Sugar. Most of the recipes on the web for a slow cooker version of baked beans include bacon or ham. Naturally that’s out for a veggie version, but I did like the idea of including a smokey note to the dish. I decided on a bit of smoked paprika and it added a lovely barbecue touch to the dish (and besides it makes the flat smell wonderful while it’s cooking). Two tablespoons of sugar may make this a bit sweet for your taste, but don’t panic on first tasting – it cooks in a lot better after a while. However, if you still find it too sweet after cooking, I’d add a teaspoon of balsamic vinegar to balance it out and brighten the flavour. Soak the pinto beans overnight. Cook for at least 6 hours. Welcome to Two Fat Veggies, a cunning plan carefully nurtured (well, much talked about before we got off our arses and got it going) by Anthea Hawdon and Sharon Wheeler. You can blame Clarissa Dickson-Wright for the title – not that she’ll be stopping by to read the blog! Anth decided to turn to the green side after seeing Clarissa advocating GBH on some cute piggies. Sharon, meanwhile, has been vegetarian since the age of 15 (and we’ll quickly gloss over just how long ago that was – suffice it to say 30-odd years is near enough!) In that time there’s been one incident with a miniscule mouthful of caviar on an Aeroflot flight back from St Petersburg. But her life is finally complete now someone has manufactured decent vegetarian Worcestershire Sauce. Cheese on toast is naked without it. What you won’t get on this blog is lots of poncy photos of eye-wateringly expensive designer kitchens or recipes where you can only rustle up the ingredients if you live inside the M25, or which take three and a half days to make (that’ll rule out anything in the style of Heston Blumenthal, then). What you will get is reviews of good eating places that we come across on our travels, along with recipes that we’ve tried, enjoyed and that anyone can make.